Expand your possibilities with mixed media using Powertex, Stone Art, and dry pigments on canvas. Powertex will be used as a base and as a medium combining dry pigments, paper and other materials to develop a dimensional mixed media artwork. Whether you are a beginner or advanced artist who wants to add additional techniques to their tool box, this class is adaptable to your skill level. Deborah Hill is a professional mixed media artist and works with a variety of select art materials to achieve dimensional effects in her work. 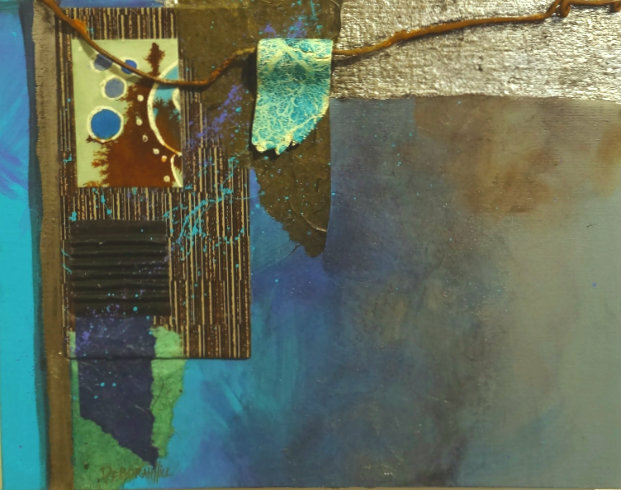 She enjoys working on canvas or hardboard with acrylic and polymer resins (Powertex) incorporating papers, fabrics, plus a variety of found objects for layered effects. Many of her pieces have a distinct bricolage flare, “if it’s handy it may find its way into the piece I’m working on at the moment”. What she says about discovering Powertex…… My work was evolving and began to include assemblage techniques when I came across these products and it was exactly what I needed to fill the gap. It really revolutionized my approach to creating a piece of art, but more importantly it is water soluble and meshes seamlessly with the other acrylics and mediums I love. For me it’s the perfect solution and bridges these materials very successfully.  One substrate (can be a primed and stretched canvas or cradled gesso board) no larger than 16”x20”. The 1.5” depth canvas looks nice but is not necessary.  A paint apron is essential, Powertex is a fabric hardener and will not come out of clothing.  Sundry tools, i.e. scissors, box blades, palette knives, stir sticks, brushes, etc., for your use during the workshop. We will break for lunch, you may brown bag it if you choose. A one day workshop using many of the same materials and techniques as the two day session. An abbreviated version designed to introduce just how easily Powertex, Stoneart and Powercolor can be used to expand mixed media capabilities for you. 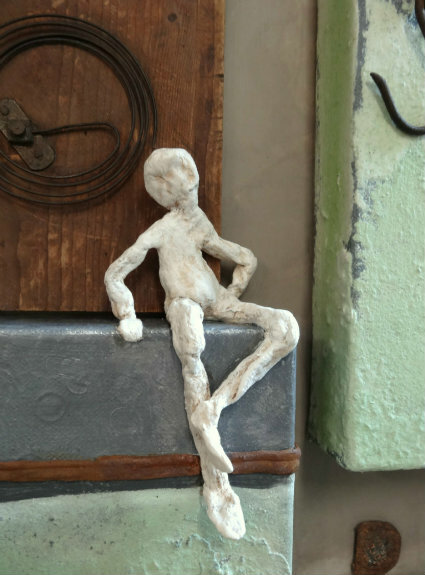 Learn to create an art piece that has unique texture as well as form a durable air dry clay to add structure and dimension to your projects. All other supplies are provided by the instructor, refer to the supply list from the 2 day session to see a list of provided materials.